Just in time for your New Year’s resolutions, Del Taco added lean ground turkey to its menu Thursday. Customers can now order turkey tacos and turkey CrunchTada tostadas Del Taco’s version of a taco pizza. It is the first Mexican fast-food chain to offer turkey as a protein option and is advertising that the 150-calorie tacos contain 33% less fat than the beef version of the dish. The tacos come with seasoned ground turkey on a crunchy corn or flour tortilla, cheddar cheese, lettuce and pico de gallo. The turkey tacos are priced individually at $1.29, or available in a turkey taco meal with two tacos, chips and a drink for $5. The taco meal, when paired with a diet drink, is 430 calories, according to a company statement. McDonald’s doesn’t think its employees should eat the food they serve. The fast food giant has advised employees to avoid meals with burgers and fries and to eat healthier options like salad and sandwiches. The advice was dispensed on the now-infamous McResource Line, the employees-only website that has told workers to sell their things and get second jobs to make ends meet. 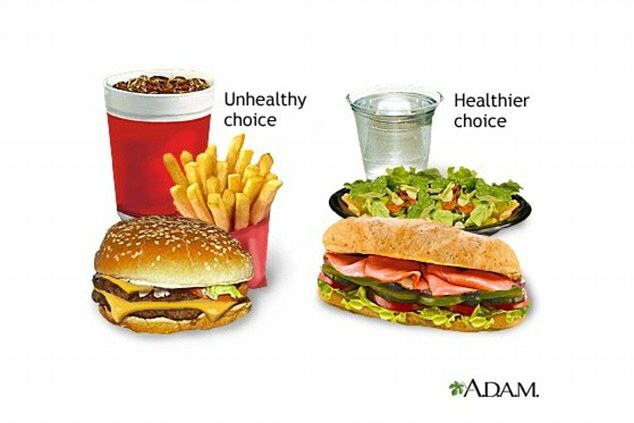 The advice is given with graphics depicting the ‘unhealthy choice’ and the ‘healthier choice.’ McDonald’s own food is in the former column. The sensible advice also tells McWorkers to ‘limit the extras such as cheese, bacon and mayonnaise.’ Tasty add-ons that are staples of many menu items they serve on a daily basis. Many locations offer steep food discounts and short breaks to employees, virtually forcing them to eat the unhealthy food, often forcing the hand of workers without the time or means to eat elsewhere. The world’s largest fast food chain wants employees to eat elsewhere. ‘Eat at places that offer a variety of salads, soups, and vegetables,’ the site says.